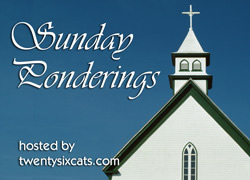 This Sunday, Paul and I visited the Sunday evening service that our church offers. It’s called “The Gathering”, and it’s for college and young adults. We had heard it was mostly singles, but we wanted to check it out anyways. We had an interesting experience, and I really wish I had attended there when I first moved to Atlanta, for the year that I was here and Paul was in Rhode Island. It doesn’t really fit us anymore, but I see it could have been a good thing for me when I was at the place in life they were trying to reach. Oh well! The pastor talked about reflecting on the new year – not so much making resolutions, but reevaluating where you are and where you’re headed. I thought he had some great things to share. Unfortunately, I didn’t have a way to take notes (and, they kept the room so dark with just a light on the pastor – it fostered sleepy time for me!). However, it did remind me of an email my mom forwarded a week ago from the pastor at her church in Orlando. I thought I’d paste parts of the email here; I think it’s good food for thought! What work am I currently engaged in that energizes me? What do I do that drains me of energy? Can I hand some/any of these things off to others without â€œdumpingâ€ on them? Are there highlights from 2007 that I can look at that give me satisfaction? Are there projects I started in 2007 that are stuck which I need to get â€œkick startedâ€? Are there projects left over from 2007 that I simply need to let go? Reflect on my most important relationships. Is there one that needs to be restored? Is there one that needs to be deepened? In what way(s) do I need Jesus Christ to change me this year? Am I willing to be changed?